What? Gretzky can skate across a rink in 2 seconds? That about sums up the gameplay in Acclaim’s NHL Breakaway ’98. In yet another game thrown into the fray of the crowded sports market, Breakaway ’98 fails to deliver much in the way of innovation, continuing on with the same formula that we’ve seen for years. The main difference? Polygons. But when graphics get in the way of fun, you don’t have much of a game. My main beef with the game is the physics. Simply put, they stink. The movement of the players is horrendous, sometimes moving very slowly, other times moving extremely quickly. Never knowing how fast you’ll be traveling, it is impossible to time any shots or passes, or generally play the game in any manner. Half the time you’ll be laughing so hard at how ridiculously fast your character is traveling, you won’t even care if your one-timer hit its mark or not. Ironically, no matter how bad the actual hockey playing part of the game is, the realism Breakaway ’98 pulls off in team management mode is daunting. It includes all the real teams, players, and stats, as well as eight international teams. Trade players if you wish, make good teams bad, or great teams better. Hell, maybe you could make some trades and have the Sharks win some games! Instead, why not manage the team for the whole season? You can do it in Breakaway ’98. Every time you win a game you’ll be allotted points which you can spend in a variety of ways – train minor league players for your team, improve your stadium (boosts attendance), or hire physical therapists to treat injured players. The possibilities are quite intriguing here, and it’s a shame it was included with such a silly hockey game. The graphics for the players are pretty good, but unfortunately have low polygon counts to keep the game’s framerate up. For the most part, the textures are great: correct numbers on the back of players as well as accurate team logos. Unfortunately, the textures for the each player’s face range from a joke to non-existent, and the coaches are the most ridiculous things I have ever seen (static bitmaps in an otherwise completely polygonal world). The animation is really bad – this may only be true because of the flawed physics, it’s impossible to tell, but in the state it is now the animation looks fake and distracting. The sound is . . . bad – yet, unobtrusive. The play-by-play is the modern novelty of hockey games, and unsurprisingly, is included. The music continues the tradition other hockey games have started – it plays the standard organ chants during points in the game when the puck isn’t in play (think penalties). 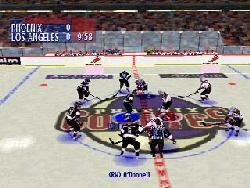 NHL Breakaway ’98 is a silly game encapsulated in a great hockey management simulation. Unfortunately, like the phoenix, the silly game breaks free and takes away any fun the simulation may have brought you.